…my computer may be dead right now due to an intense keyboard injection of fresh mozzarella juice. Really. It all happened with an innocent Skype conversation home. And as usual, instead of talking about my day or my feelings or their day or their feelings, I was talking about food. Lots of food. My breakfast, my lunch, my dinner — I mean, what else do you talk about when you are Skyping from Italy? At the time of my conversation, we had already set the table with our beautiful antipasto of fresh mozzarella, cut tomatoes, and arugula. “Mmmmm,” I said into the microphone. “Mmmm?! What mmmm?!? !” replied my jealous mother. “THIS MMMMMMMM!” I exclaimed in reply. And that’s when it happened. I brought the whole platter over to my camera, leaned it over to allow for maximum viewing, and…Splat. Mozzarella juice. Cheese whey. On my keyboard. At first, it didn’t do anything except my make mom’s envious expression get a bit more pronounced. But slowly, over the next hour, as I attempted to type, something seemed very, very wrong. Which brings me to tonight, almost 24 hours later. My computer is sitting upside down in the guys’ apartment with the keyboard thoroughly dismantled (“WHOA!” they yelled when they first removed the keys. “It smells so much like mozzarella in your computer!” In lieu of responding, I banged my head against the wall several times.) They tell me it might survive, but fortunately the data on my hard drive will be recoverable no matter what, if not the functionality of the full computer. And even MORE fortunately, I purchased personal property insurance before leaving for Italy, so even if it doesn’t revive, I can get a computer replaced with minimal difficulty. So here is my advice for anyone else traveling: BUY PERSONAL PROPERTY INSURANCE AHEAD OF TIME. I used Haylor (http://www.haylor.com/, the college students program, which is the one Yale recommends), but there are several with good plans that extend their coverage worldwide. Because of this, even though I didn’t think I’d have to use it this early, I am covered under accidents, drops, theft, etc, etc. And depending on how this whole cheese episode turns out, I think I will feel very grateful indeed to have purchased it. 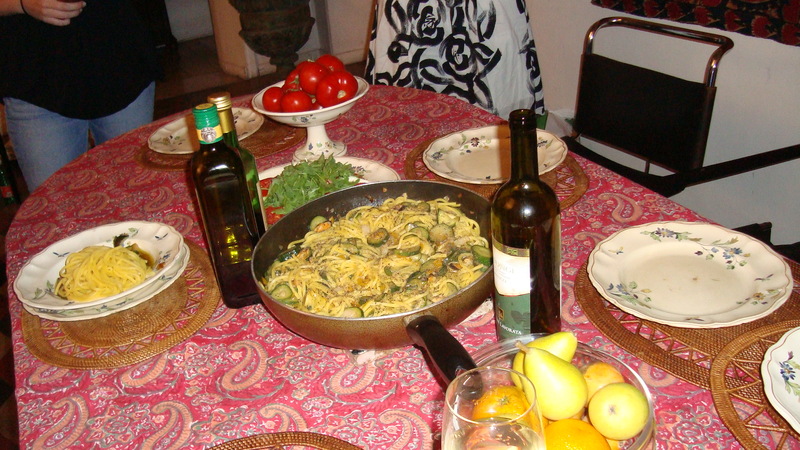 Our home-cooked dinner of pasta with zucchini and mussels. Don't believe the innocent expression on the mozzarella's face in the upper left. That is a dangerous - I repeat, armed and dangerous - criminal you are looking at. So this one time at work I spilled water all over the keyboard and the same thing happened. So I switched keyboard with some other person’s keyboard, and voila! It was no longer my problem. That was a pretty cheesy posting. I loved it.